There are things rhinos can and can’t do. Rhinos can wallow in mud and bathe in the sun, but can they be adventurous? In Once Upon a Small Rhinoceros, one little rhino has an ambitious plan—she wants to see the world! 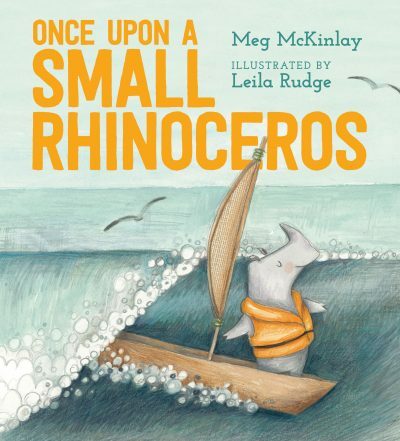 A great recommendation for kids aged two to six, this book is another charming collaboration between creators Meg McKinlay and Leila Rudge. While their much-loved No Bears is playful and irreverent, this tale is inspirational and encourages children to march to their own beat. McKinlay has written a strong heroine who dares to dream big and isn’t swayed by the doubts of others. This book also pairs perfectly with Rudge’s own picture book Gary (shortlisted for the 2017 CBCA Awards), which tells the story of another intrepid outlier: a pigeon who cannot fly. Rudge’s mixed-media illustrations—using pencil, watercolour and collage—add layers of wonderful details for children to discover. The story itself has a powerful message that can inspire kids to stay true to themselves and encourage them to test the limits of what is possible.